A man who doctors thought would die after being struck by lightning says life will never go back to how it was before. Geordie Allen told the BBC his goal is to get back on his feet and try to have a normal life, one year on from the storm at Killowen Primary School in Lisburn, in Northern Ireland. He was hit by a lightning bolt that was ‘five times hotter than the sun’, but Geordie was determined to recover, reports Belfast Live . Geordie, 37, was in the ­playground on school sports day with Geordie Jnr, five, and seven-year-old Georgha when they were hit by a bolt that was five times hotter than the sun. His boy was thrown out of his arms and catapulted across the playground, his daughter’s clothes were burnt into her skin and his own heart stopped for 55 minutes. 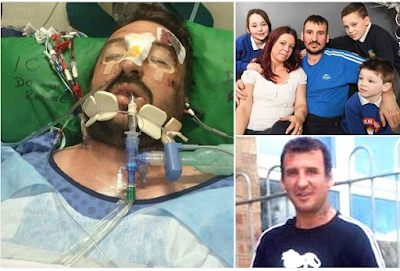 The dad-of-six was in a coma for four weeks – then spent the next five months in hospital , strapped up to monitors and unable to walk. Geordie Jnr was rushed to the ­specialist children’s unit at Royal Belfast Hospital along with Georgha. He needed four operations that day. The children returned home after a few days but their dad was transferred to a specialist care unit at Ulster Hospital. Geordie’s wife Sharon said: “It was a nightmare. It repeats with me everyday. I just remember the screams.